For other uses, see Iceberg (disambiguation). An iceberg in the Arctic Ocean. An iceberg is a large piece of freshwater ice that has broken off a glacier or an ice shelf and is floating freely in open (salt) water. Another name for iceberg is "ice mountain". Small bits of disintegrating icebergs are called "growlers" or "bergy bits". Icebergs are possible on Earth because the oceans are filled with liquid water, a substance less dense when solid than liquid. Planets with oceans consisting of different substances like methane cannot have icebergs, as their chunks of frozen liquid would sink. Because 90 percent of an iceberg is below the surface and not visible, icebergs have been considered a serious maritime hazard ever since the 1912 loss of the "unsinkable" RMS Titanic, leading to the formation of the International Ice Patrol in 1914. The expression "tip of the iceberg", illustrates a difficulty that is only a small, visible part of a larger, complex problem. The largest iceberg ever reliably recorded was Iceberg B-15A which split off the Ross Ice Shelf in Antarctica in 2000. The word iceberg is a partial loan translation from the Dutch word ijsberg, literally meaning ice mountain, cognate to Danish isbjerg, German Eisberg, Low Saxon Iesbarg and Swedish isberg. Because the density of pure ice is about 920 kg/m3, and that of seawater about 1025 kg/m3, typically about one-tenth of the volume of an iceberg is above water (which follows from Archimedes's Principle of buoyancy). The shape of the underwater portion can be difficult to judge by looking at the portion above the surface. The visible "tips" of icebergs typically range from 1 to 75 metres (3 to 200 ft) above sea level and weigh 100,000 to 200,000 metric tons (110,000 to 220,000 short tons). The largest known iceberg in the North Atlantic was 168 metres (551 ft) above sea level, reported by the USCG icebreaker East Wind in 1958, making it the height of a 55-story building. These icebergs originate from the glaciers of western Greenland and may have interior temperatures of −15 to −20 °C (5 to −4 °F). Winds and currents tend to move icebergs close to coastlines, where they can become frozen into pack ice (one form of sea ice), or drift into shallow waters, where they can come into contact with the seabed, a phenomenon called seabed gouging. The largest icebergs recorded have been calved, or broken off, from the Ross Ice Shelf of Antarctica. Iceberg B-15, photographed by satellite in 2000, measured 295 by 37 kilometres (183 by 23 mi), with a surface area of 11,000 square kilometres (4,200 sq mi). The largest iceberg on record was an Antarctic tabular iceberg of over 31,000 square kilometres (12,000 sq mi) [335 by 97 kilometres (208 by 60 mi)] sighted 150 miles (240 km) west of Scott Island, in the South Pacific Ocean, by the USS Glacier on November 12, 1956. This iceberg was larger than Belgium. 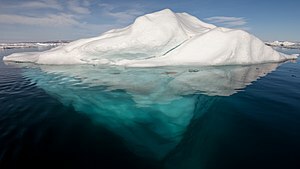 A small iceberg less than 2 meters (6.6 feet) across that floats with less than 1 meter (3.3 feet) showing above water is called a growler,  and is smaller than a bergy bit, which is usually less than 5 meters (15 feet) in size. Both are generally spawned from disintegrating icebergs. As a piece of iceberg ice melts, it produces a fizzing sound called the "Bergie Seltzer". This sound results when the water-ice interface reaches compressed air bubbles trapped in the ice. As this happens, each bubble bursts, making a "popping" sound. The bubbles contain air trapped in snow layers very early in the history of the ice, that eventually got buried to a given depth (up to several kilometers) and pressurized as it transformed into firn then to glacial ice. Different shapes of icebergs. 1: Tabular; 2: Wedge; 3: Dome; 4: Drydock; 5: Pinnacled; 6: Blocky. In addition to size classification, icebergs can be classified on the basis of their shape. The two basic types of iceberg forms are tabular and non-tabular. 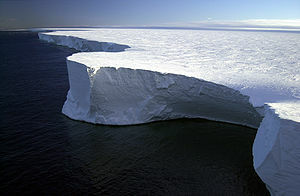 Tabular icebergs have steep sides and a flat top, much like a plateau, with a length-to-height ratio of more than 5:1. This type of iceberg, also known as an ice island, can be quite large, as in the case of Pobeda Ice Island. Antarctic icebergs formed by breaking off from an ice shelf, such as the Ross Ice Shelf or Filchner-Ronne Ice Shelf, are typically tabular. The largest icebergs in the world are formed this way. Dome: An iceberg with a rounded top. Pinnacle: An iceberg with one or more spires. Wedge: An iceberg with a steep edge on one side and a slope on the opposite side. Dry-Dock: An iceberg that has eroded to form a slot or channel. Blocky: An iceberg with steep, vertical sides and a flat top. It differs from tabular icebergs in that its aspect ratio, the ratio between its width and height, is small, more like that of a block than a flat sheet. The iceberg suspected of sinking the RMS Titanic; a smudge of red paint much like the Titanic's red hull stripe was seen near its base at the waterline. Before the early 1910s, although there had been many fatal sinkings of ships by icebergs, there was no system in place to track icebergs to guard ships against collisions. In 1907, SS Kronprinz Wilhelm, a German liner, had rammed an iceberg and suffered a crushed bow, but was still able to complete her voyage. The advent of steel ship construction led designers to declare their ships "unsinkable". The April 1912 sinking of the Titanic, which killed 1,518 of its 2,223 passengers and crew, changed all that. For the remainder of the ice season of that year, the United States Navy patrolled the waters and monitored ice flow. In November 1913, the International Conference on the Safety of Life at Sea met in London to devise a more permanent system of observing icebergs. Within three months the participating maritime nations had formed the International Ice Patrol (IIP). The goal of the IIP was to collect data on meteorology and oceanography to measure currents, ice-flow, ocean temperature, and salinity levels. They monitored iceberg dangers near the Grand Banks of Newfoundland and provided the "limits of all known ice" in that vicinity to the maritime community. The IIP published their first records in 1921, which allowed for a year-by-year comparison of iceberg movement. Aerial surveillance of the seas in the early 1930s allowed for the development of charter systems that could accurately detail the ocean currents and iceberg locations. In 1945, experiments tested the effectiveness of radar in detecting icebergs. A decade later, oceanographic monitoring outposts were established for the purpose of collecting data; these outposts continue to serve in environmental study. A computer was first installed on a ship for the purpose of oceanographic monitoring in 1964, which allowed for a faster evaluation of data. By the 1970s, icebreaking ships were equipped with automatic transmissions of satellite photographs of ice in Antarctica. Systems for optical satellites had been developed but were still limited by weather conditions. In the 1980s, drifting buoys were used in Antarctic waters for oceanographic and climate research. They are equipped with sensors that measure ocean temperature and currents. Acoustic monitoring of an iceberg. Side looking airborne radar (SLAR) made it possible to acquire images regardless of weather conditions. On November 4, 1995, Canada launched RADARSAT-1. Developed by the Canadian Space Agency, it provides images of Earth for scientific and commercial purposes. This system was the first to use synthetic aperture radar (SAR), which sends microwave energy to the ocean surface and records the reflections to track icebergs. The European Space Agency launched ENVISAT (an observation satellite that orbits the Earth's poles) on March 1, 2002. ENVISAT employs advanced synthetic aperture radar (ASAR) technology, which can detect changes in surface height accurately. The Canadian Space Agency launched RADARSAT-2 in December 2007, which uses SAR and multi-polarization modes and follows the same orbit path as RADARSAT-1. Icebergs are monitored worldwide by the U.S. National Ice Center (NIC), established in 1995, which produces analyses and forecasts of Arctic, Antarctic, Great Lakes and Chesapeake Bay ice conditions. More than 95% of the data used in its sea ice analyses are derived from the remote sensors on polar-orbiting satellites that survey these remote regions of the Earth. Iceberg B15 calved from the Ross Ice Shelf in 2000 and initially had an area of 11,000 square kilometres (4,200 sq mi). It broke apart in November 2002. The largest remaining piece of it, Iceberg B-15A, with an area of 3,000 square kilometres (1,200 sq mi), was still the largest iceberg on Earth until it ran aground and split into several pieces October 27, 2005, an event that was observed by seismographs both on the iceberg and across Antarctica. It has been hypothesized that this breakup may also have been abetted by ocean swell generated by an Alaskan storm 6 days earlier and 13,500 kilometres (8,400 mi) away. Ice sheet, 260 km2 (100 sq mi), broken off of Petermann Glacier in northern Greenland on August 5, 2010, considered to be the largest Arctic iceberg since 1962. About a month later, this iceberg split into two pieces upon crashing into Joe Island in the Nares Strait next to Greenland. In June 2011, large fragments of the Petermann Ice Islands were observed off the Labrador coast. Iceberg B-17B 140 km2 (54 sq mi), 1999, shipping alert issued December 2009. ^ "Definitions of the word "Iceberg"". Google. Retrieved 2006-12-20. ^ "Common Misconceptions about Icebergs and Glaciers". Ohio State University. Icebergs float in salt water, but they are formed from freshwater glacial ice. ^ "Iceberg". Online Etymology Dictionary. Retrieved 2006-03-26. ^ a b "Facts on Icebergs". Canadian Geographic. 2006. Archived from the original on 2006-03-31. ^ "Antarctica shed a 208-mile-long berg in 1956". Polar Times. 43. 2005-01-20. p. 18. ^ "Sizes and Shapes of Icebergs" (PDF). International Ice Patrol. Retrieved 2006-12-20. ^ Holly Gordon (2006). "Iceberg Physiology". Canadian Geographic. Archived from the original on 2006-03-31. ^ "Envisat". European Space Agency. Retrieved 2011-03-09. ^ Ainslie MacLellan (2006). "Tracking Monsters". Canadian Geographic. Archived from the original on 2006-10-31. ^ "New Iceberg Breaks off Ronne Ice Shelf in Antarctica". NOAA. 15 October 1998. Retrieved 2011-03-09. ^ Martin, Seelye; Drucker, Robert; Aster, Richard; Davey, Fred; Okal, Emile; Scambos, Ted; MacAyeal, Douglas (2010). "Kinematic and seismic analysis of giant tabular iceberg breakup at Cape Adare, Antarctica". Journal of Geophysical Research. 115. doi:10.1029/2009JB006700. ^ "Alaskan storm cracks giant iceberg to pieces in faraway Antarctica". ^ MacAyeal, Douglas R; Okal, Emile A; Aster, Richard C; Bassis, Jeremy N; Brunt, Kelly M; Cathles, L. Mac; Drucker, Robert; Fricker, Helen A; Kim, Young-Jin; Martin, Seelye; Okal, Marianne H; Sergienko, Olga V; Sponsler, Mark P; Thom, Jonathan E (2006). "Transoceanic wave propagation links iceberg calving margins of Antarctica with storms in tropics and Northern Hemisphere". Geophysical Research Letters. 33 (17). doi:10.1029/2006GL027235. ^ "Iceberg A-38B off South Georgia". Visible Earth. Archived from the original on 2008-10-05. Retrieved 2011-03-09. ^ "Iceberg four times the size of London breaks off from Antarctica ice shelf". The Telegraph. Retrieved 14 July 2017. ^ Brad Lendon, CNN (22 April 2014). "Iceberg is twice the size of Atlanta - CNN.com". CNN. ^ "Pine Island Glacier Quickly Drops Another Iceberg". Nasa Earth Observatory. NASA. Retrieved 12 November 2018. ^ "Huge ice sheet breaks from Greenland glacier". BBC. 2010-08-07. Retrieved 2011-03-09. ^ "Massive Iceberg Crashes into Island, Splits in Two". Archived from the original on 2011-03-10. ^ "Massive ice island heading for southern Labrador". CBC News. 2011-06-23. ^ "Shipping alert issued over giant iceberg". Associated Press. December 11, 2009. Wikimedia Commons has media related to Iceberg.